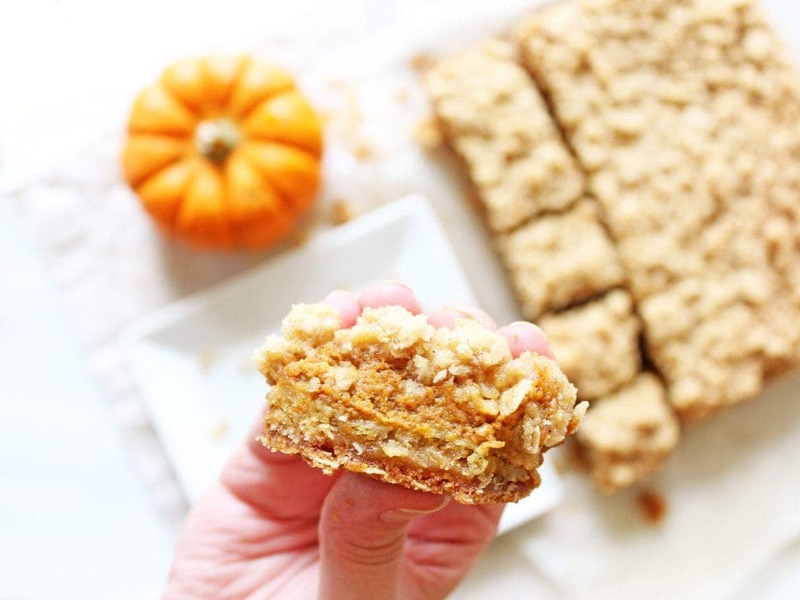 Easy pumpkin pie bars taste just like pumpkin pie and are topped with an oat crumble topping that doubles as a sturdy flavorful crust. And the pumpkin baking spree continues! This week I made some easy pumpkin pie bars and they are out of this world. They taste just like pumpkin pie, but with a crumbly oat topping, which just so happens to double as the crust. 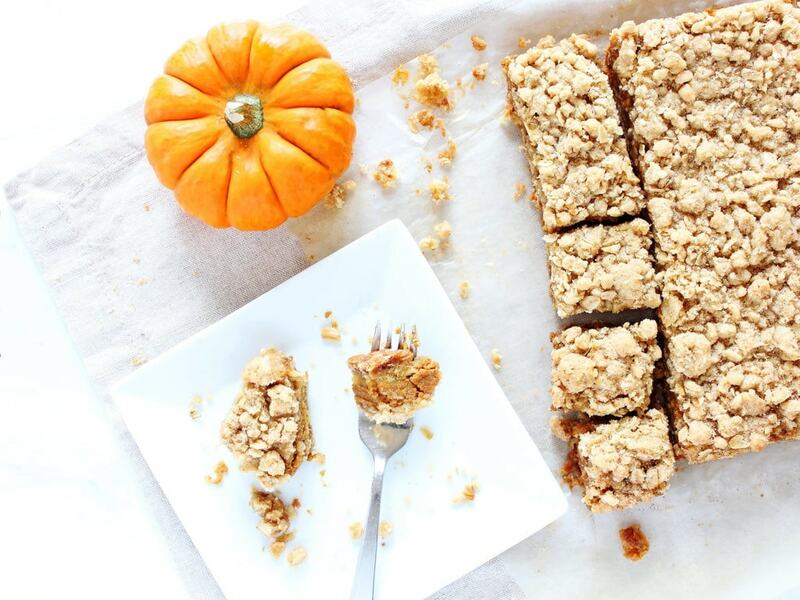 First off, let me explain why these pumpkin pie bars are easy. The recipe only requires two bowls: one for the oat crumble and the other for the pumpkin pie filling. Both mixtures require no electric mixer, just stirring by hand. After that, it’s all about the layering. 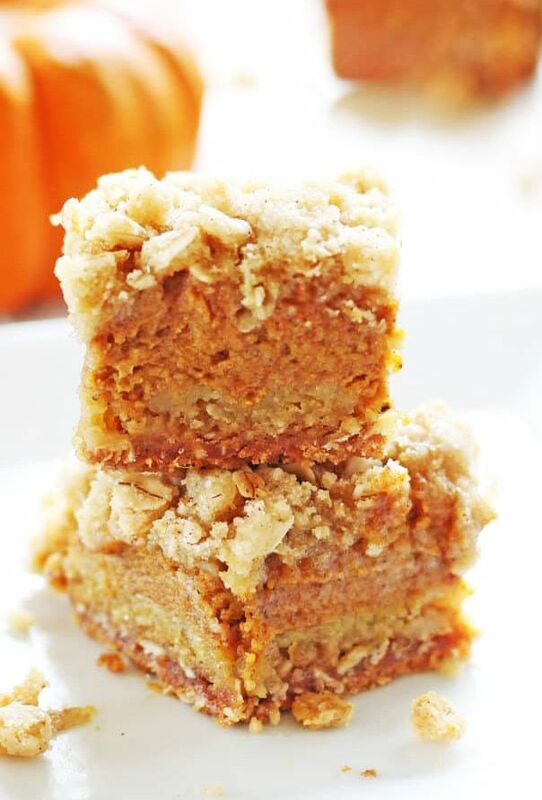 The first layer of these easy pumpkin pie bars is made up of HALF of the crumble oat topping. Press that down into a prepared 8×8 baking dish and partially bake it. That partial bake is crucial because it will make a sturdier base for the pumpkin pie filling, which is a little softer and smoother (like pumpkin pie). The other half of the crumble oat mixture will serve as the topping later on in the baking process. But first, let’s talk about this unbelievable pumpkin pie filling. And what makes it better is the crumble oat topping. It is added on after the pumpkin filling has baked for 15 minutes, then the whole dish bakes for another 20 minutes to let the crumble set and get golden brown. 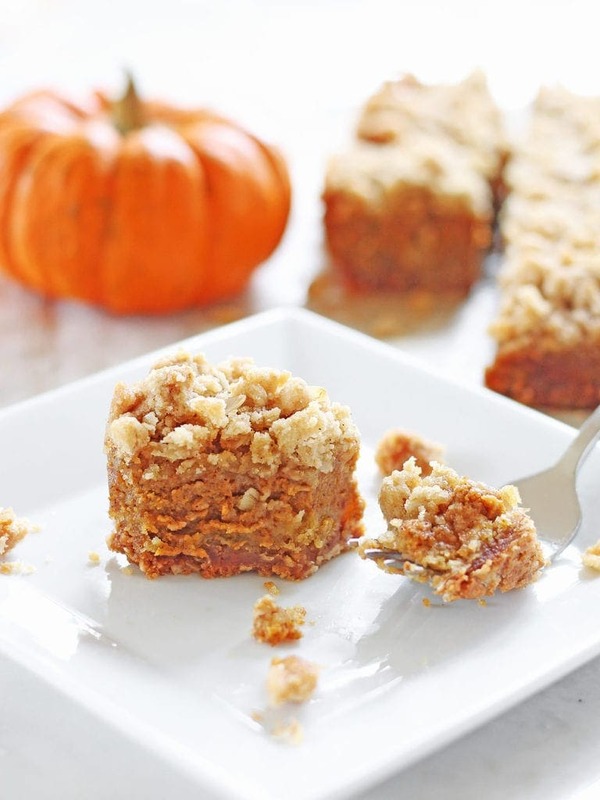 The butter and sugar oat crumbles melt in your mouth and into the pumpkin pie filling as you bite into the bars. 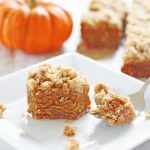 You get a real texture experience with these easy pumpkin pie bars—a sturdy, buttery crust; smooth pumpkin pie spice filling; and crumbly oat topping. If you ask me, those three things are the making of perfect pumpkin pie bars. So before you get started on the recipe, let me break it down for you. THREE baking times (bake the crust for 15 minutes, add the pumpkin pie filling and bake for 15 minutes, add the crumble oat topping and bake for 20 minutes). TWO bowls (one for the crust/crumble topping and one for the pumpkin pie filling). 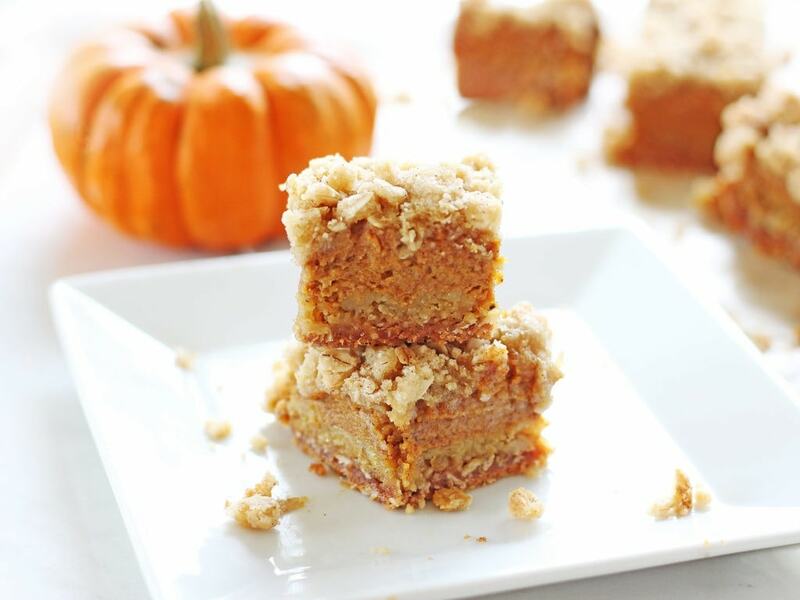 ONE incredible recipe for pumpkin pie bars. There you have it, easy as one, two, three. Enjoy and happy fall! Preheat oven to 350° F. Line an 8x8 baking dish with parchment paper and lightly spray with nonstick cooking spray. Set aside. In a mixing bowl, whisk together flour, oats, salt and baking soda for 30 seconds. Add in 1/2 cup granulated sugar and 1/2 cup brown sugar and mix until no clumps remain. Combine melted butter and vanilla and add to mixture, then stir with a spoon until evenly moistened. Meanwhile in a mixing bowl, whisk together 1/4 cup granulated sugar, 1/4 cup brown sugar, cinnamon, nutmeg, ginger, cloves and salt. Add in egg, egg yolk and vanilla, and stir until blended. Mix in pumpkin then milk. Pour mixture over baked crust (it's okay if it is still warm). Return to oven to bake 15 minutes. After 15 minutes, remove bars from oven and sprinkle remaining oat crumble mixture over top while breaking the crumb into small bits. Transfer oven rack to the top-third of the oven (not directly underneath the top but a level or two below) and return the bars to oven to bake about 20 - 25 minutes longer. Bars are finished when the crumble top is golden and center only jiggles slightly. Allow to cool 1 hour at room temperature, then transfer to refrigerator to cool 1 hour longer. Cut into squares and serve. Store pumpkin pie bars in an airtight container at room temperature for up to five days. These are causing my mouth to water. YUM! These look SO darn good! And this is exactly how I like my pie- sans crust! 😉 I need to try these soon! These looks so divine! Pinned to try later. Thanks for sharing at Funtastic Friday. Thank you so much, Sherry! Always happy to link up. Sounds delicious!! For some reason I can’t see your photos – but I’m glad you brought them to Fiesta Friday!